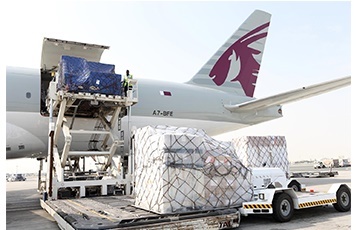 The cargo arm of the Qatar national carrier, Qatar Airways has made no secret of the fact that they plan to expand their cargo operations worldwide within the coming years. Much has been put into motion in this direction during the past twelve to eighteen months with new cargo aircraft additions to the fleet and joint ventures with other carriers. At last week’s Air Cargo China 2016 show held in Shanghai, Ulrich Ogiermann, QR’s Chief Officer Cargo, informed his audience that the world’s third largest international cargo carrier is striving to be a leading market player in three new areas. Namely - Transpacific, Australia and South America. The aim is to have these new markets up and running within the next nine months. This will be possible says Ogiermann due to the constant expansion of the Doha-based airline’s fleet of long-haul aircraft. On the cargo side, Qatar Airways already operates nine Boeing 777 freighters as well as eight Airbus A330 freighters and two Boeing 747Fs which are leased in. The carrier has also recently opened a new European hub in Luxembourg, right on the doorstep of one of its major competitors, Cargolux. The aim is to grow the all-cargo fleet up to 22 aircraft by 2017. It also offers considerable belly hold space on its large fleet of long-haul passenger aircraft. QR Cargo are planning to double all freighter frequencies into Luxembourg and have also added New York (JFK) and Halifax as freighter destinations. Which cities will QR serve in Australia, South America? In this respect, QR Cargo remains relatively silent until now. Will they enter into another joint venture on the transpacific route? There is the possibility that QR Cargo will then look at their own round-the-world freighter service in 2017 when they receive the three new freighters. Nothing has been said as to where and when QR cargo will start serving Australia. It will be interesting to see what sector to South America may be chosen. The eastern South American market is presently undergoing a tough time as Brazil, Argentina and Venezuela continuing on an economic downturn. The western part of the continent however, looks a brighter possibility. This is aimed at what QR cargo terms as providing stress-free and comfortable transport for horses, pets, livestock and exotic animals, which are carried from or transit through their main hub in Doha. The QR Cargo Terminal in DOH has a fully equipped live animal facility run by their own dedicated team of ground and animal handling staff. The facility, which has 4,200 square metres, is fully air conditioned and also boasts a large holding area and stalls for horses.